Many of the homes in the Liberty Square complex on Grove Street in Ypsilanti Township are already boarded and ready for foreclosure sale. 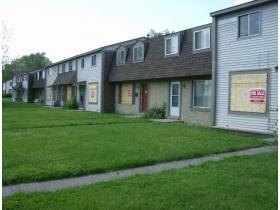 All 151 units, some of which are still occupied, will be condemned Tuesday, Ypsilanti Township has resolved. Residents living in the Liberty Square complex of townhouses will see a sticker appear on their homes Tuesday, when the Ypsilanti Township Building Department places notices on each and every unit, announcing they are condemned and giving residents 30 days to vacate. Building Department Director Ron Fulton told the township's board of trustees Thursday that the complex, located just northwest of the intersection of Rawsonville Road and Grove Street, is a blight on the community and recommended the township take legal action against property owners. In Fulton's office, there are three binders filled with multiple reams of documents, containing details and photographs of code violations from throughout the aging and dilapidated complex of townhouses. These problems, Fulton said, can no longer be solved by notifying individual homeowners of the violations. A notice of multiple incidences of violation of the township's property maintenance code was sent to the Grove Park Homes Improvement Association and its representative, Joseph Koenig, April 23. This notice, Fulton said, set a deadline of May 29 for the organization to bring the properties into compliance. If this deadline is not met, the township plans to revoke the certificates of occupancy for all units in the complex Tuesday and initiate property abatement proceedings. Code violations, according to Fulton, include issues of garbage and unsanitary conditions outside units, deteriorated roofs and eaves, a need for exterior painting, deteriorating structural members and walls, windows and doors in disrepair, electrical hazards, and many other violations. The initiation of legal action against property owners, approved by all trustees present at a special township board of trustees meeting called on Thursday afternoon, becomes complicated because 63 units, previously foreclosed upon, are owned by the Washtenaw County Treasurer, 28 are owned by the Grove Park Home Improvement Association, 17 are owned by Grove Park Homes LLC and the remaining 43 are owned by private individuals. Trustee Mike King was absent from the special meeting and did not vote; the motion to authorize legal action was approved with a vote of 6-0. The township is not telling the whole story, according to Koenig, the property manager for Grove Park Homes Improvement Association, which he said has taken on the task of systematically trying to improve the Liberty Square neighborhood. Koenig said that if the township had taken action against code violations in the past, things would never have gotten as bad as they did in the complex. He said he responded to the notice of violation last week, asking township officials to help the association by providing an itemized list of what needs to be fixed, which he has not received. This itemized list is important, Koenig said, because the association is responsible for certain exterior elements while the individual property owners are responsible for windows, doors, interior and yard maintenance. To create a plan of action to fix the violations, he said the association would first need a complete list of problems that could be divided between the homeowners and the association itself. Most of the problems over the years, Koenig said, have been caused by irresponsible homeowners in the complex, a problem he hopes the association solved by spending about $150,000 in legal fees to force about 28 of these problem residents out of the community. The association now owns those 28 foreclosed, vacant properties. These accomplishments, he said, include new roofs on 75 of the 151 units and the removal of problem residents. Koenig said he realizes there are still problems in the complex that need to be remedied, but does not think condemning all 151 residences is appropriate or justified. In fact, he has records of 12 units that have been granted certificates of compliance in 2009 and 2010, which are normally good for 30 months. Fulton said these certificates, given out through the rental program, are not as comprehensive as a complete inspection, and his department will revoke all existing certificates of occupancy if the code violations are not resolved by Tuesday. Given more time, Koenig said, he is confident that the association could make all necessary repairs to bring the complex into compliance with township codes. The association, he said, is already initiating legal action against the Washtenaw County Treasurer's office, the legal owner of 63 of the foreclosed units slated for auction in July and November, because he claims they have not paid association membership fees required of every homeowner in the community. If the township requires residents that still live in Liberty Square to leave, he said, there will no longer be membership fees coming into the association and they will not be able to make the repairs that need to be made. Township Attorney Doug Winters advised the board to move forward with litigation against any and all property owners to eliminate the blight on properties in Liberty Square. He told trustees that if legal action is necessary to abate the properties, suit would likely be filed against a mixture of private owners of townhouses, the Grove Park Homes Improvement Association, and Grove Park Homes LLC. Bruce Gatward, who owns a rental unit in the complex, also spoke at the meeting, asking trustees and township staff why his newly-rebuilt unit is slated to be condemned next week. Fulton addressed Gatward's concerns, explaining that, in many cases in the complex, firewalls in the attics have been compromised and mold problems from units in the same building could potentially spread, meaning even a perfectly-maintained unit could be in violation because of problems in neighboring units. Later, Gatward said the firewalls in his attic are intact and the mold inspector who came to the unit when mold remediation was completed last October told him that there was no risk of mold invading his unit from other addresses in the building. Fulton said all Liberty Square residents who receive notices that the certificate of occupancy has been revoked for their residence officially have 30 days to relocate, but expects that the township will work with people, since moving so quickly may be difficult. Washtenaw County has offered assistance to residents in the neighborhood seeking a new home, Fulton said.